Wednesday was one of those days when you felt sure that the race would be abandoned and many of the fleet probably wish it was. The race officers in their wisdom shortened the course at the top mark for the Divison 2 fleet which meant we in Div 1 had a short leg back from the heads to the finish. We started in more breeze than forecast and finished in almost unmeasurable wind. From the start we had Aggrovation below and the rest of the fleet above but arriving on the line with speed and with little to spare. For a while the good start kept us up with the fleet and looking good on handicap until the wind faded. Aggrovation had climbed above us and was well ahead but now becalmed. Larrikin took the shore route out of the tide and sailed away underneath. Eventually we adopted the light air tactic of avoiding the middle and headed for the shore where a little local gradient was at play and the tide was less. As we rock hopped along the shore we passed one yacht after the other until we arrived at the mark in no breeze. We had to run away from the mark to build speed to get steerage and while it felt painful to us it was diabolical for others including Trim and Viva. Aggrovation gave up her lead on us doing the same tactic of running away from the mark to get steerage only they were out in more tide and it took longer. The tracks from the chart plotter were not as diabolical as expected against the incoming tide and with just 2 knots of breeze. After rounding the mark I was surprised to see Allegro and Fidelis not far ahead so if we could make the shortened course finish line before the cut off we would be in a good position. Fortune smiled on us again with a late zephyr of three knots bringing us home on a beam reach ahead of all the Northshore 38 and other fancied competitors. A third place was a very good result on the day and it increased our lead on the progressive points. For the second week we found a fellow competitor to assist with a tow back to the club and this was a long tow almost from the Heads to Rushcutters Bay. At seven knots the little Britannia was almost up on the plane. It was a long slow day and a big thank you to the crew. Tracks rock hopping against the tide in 2 knots of breeze. Sanding and filling holes in the deck ready for glassing is painfully slow. The orbital sander with the vacuum cleaner attached has sped up the flat surface sanding but I still had all the holes to fill and all the gunwales to fair by hand. Friend Kevin gave the sander and vacuum cleaner a work out on the deck on Thursday while I fitted the four layers of 3 mm ply doubler under the deck at the stem. 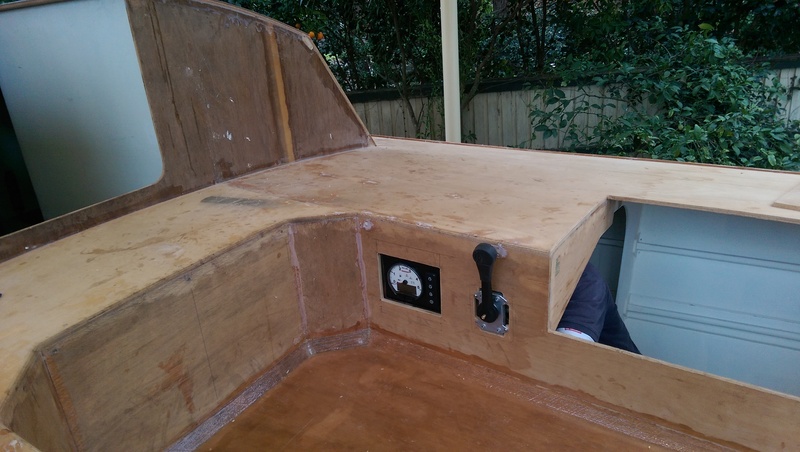 Friday was a mixed bag including finishing off the last 125 mm of capping on the gunwales, sanding some of the ceiling in the cabin and fitting hinges to the V bunk tops in the evening. Most of Saturday was spent filling screw holes out in the cold wind. Each hole was primed with neat epoxy to fill the exposed wood and while the epoxy was still tacky filled with a thickened epoxy mix. 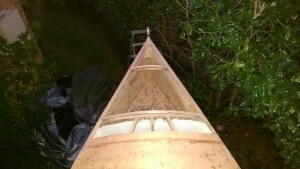 Today I warmed up planing and torture boarding the gunwales. 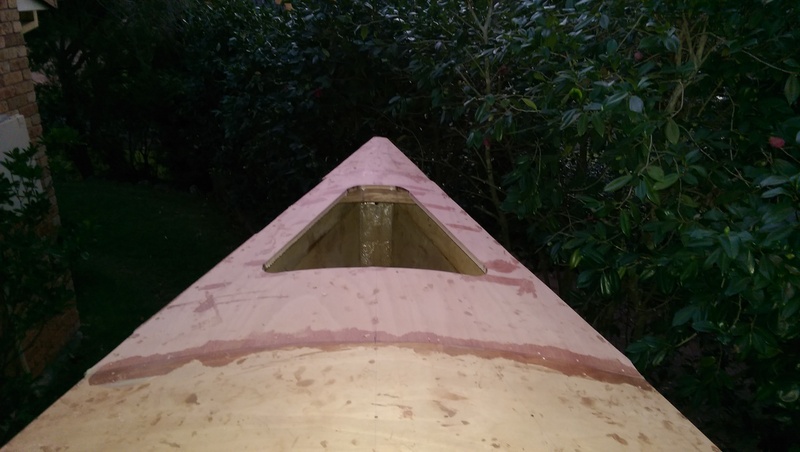 On Thursday we had taken a cut down the edges of the gunwales with the power planer and today I used a medium length plane to round off the edge and finished up with a very fine setting on a 50 year old hand plane. I have had this plane since I was a teenager and used it to trim the edges of 1/16 inch Queensland cedar veneer we used to use for building cold moulded Moth Class yachts. it is one of my favourite wood working tools as it is simple and very light so you can wield it all day. The final task was to torture board the edges with a metre long board and 60 grit paper which was pretty good exercise on a cold day. I now need some fine weather now for the deck glassing. Friend Kevin helping with the sanding. Photo taken from a ladder in the neighbour’s yard. We seem to be performing better since we put Passion on a diet. I estimate we have removed 300 kilo of ballast and surplus equipment. 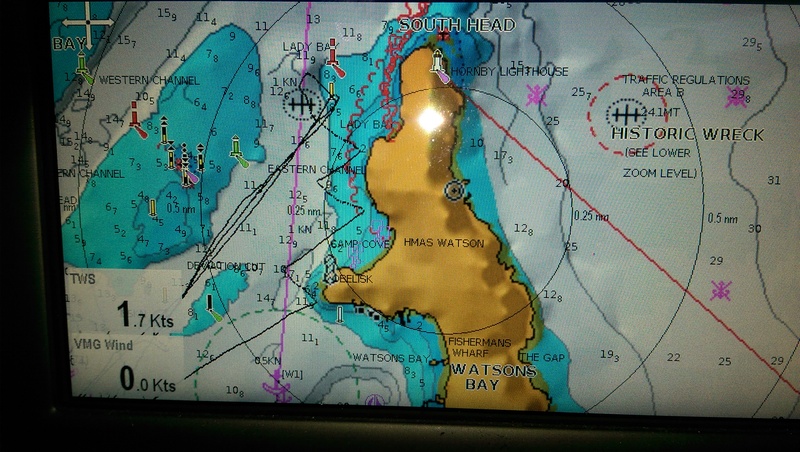 We have compensated by being a bit more conservative with the sail area and that paid off well today.With the No 2 genoa with a LP of 135% we held our own on the reach to the heads and sailed well on the work back to Rose Bay. It helped that we made a good start on the boat end and kept low out of the wind shadow of Bradleys and it helped when on the beat to windward Malcolm pulled the adjustable back stay tighter than ever. The reward for all this was a second place today to the heavy air specialist Viva. Our all winds performance has however rewarded us with a first place on progressive points. While the points are nice due to our handicap what was nicer was the fastest time position ahead of all the Northshore 38 and Aggrovation. We did chase Izzi all the way around the course and were rewarded on the last throw of the dice when we took their transom and held on to the middle of the harbour and came back on a lift. It was our one bit of luck for the day and a bit of icing on the cake. 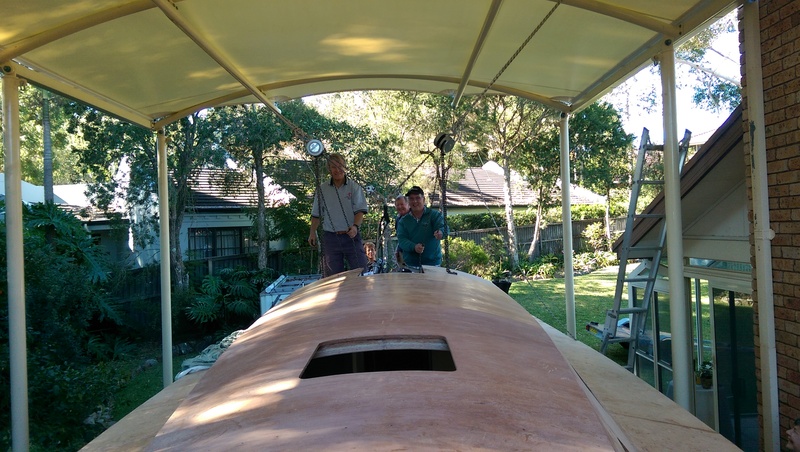 Now that the capping pieces on the gunwhale of our Didi 40 Cr are planed and sanded in line with the deck and hull the sweet shape of the yacht is clear. Once I started sanding the deck I could not stop till the front half was finished. 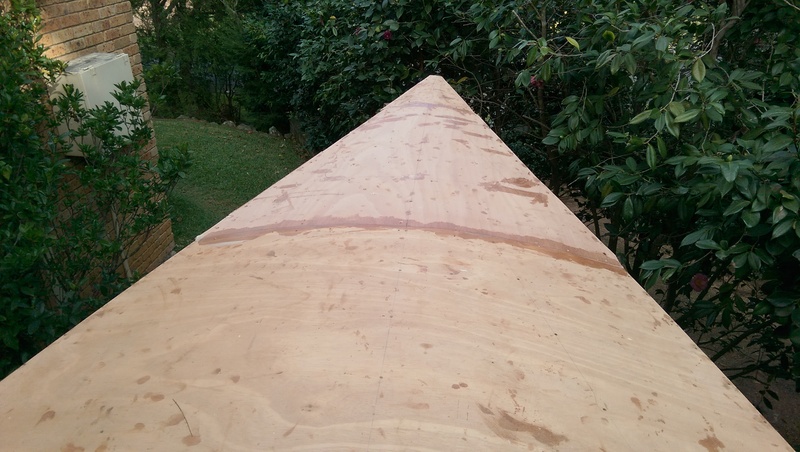 I needed to add the rope as a hand hold to stop me sliding off the sanded deck. 24 mm plywood mast knee. 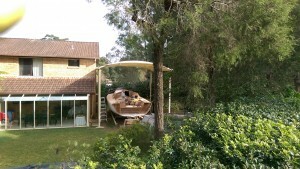 The deck in this area is reinforced with two layers of 6 mm ply so the total is four layers of 6 mm ply from side to side. The hand hold will be practical as well as lightening the appearance of the knee. 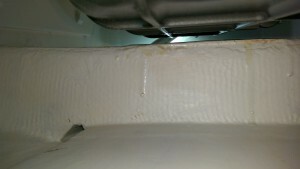 The little infill panel at the front of the V berth shaped so that the bunk tops do not hit the frames when the tops are folded back. Lots of storage under the bunks. There are so many interesting jobs to do on the boat that I feel spoilt for choices. 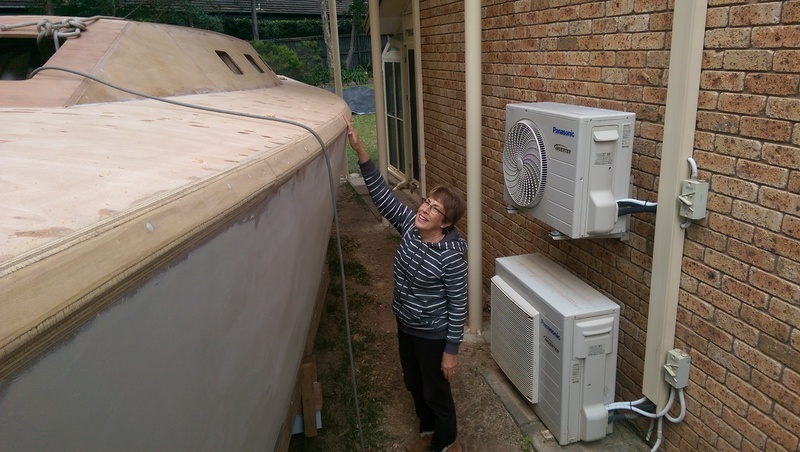 I know there is a critical path which will get the boat finished in the shortest time but I think it is my boat and if I want to do this particular job now I can. So a few little jobs have been finished and some large ones done. The capping on the gunwhale is glued in place and planed and sanded down to the line of the deck and hull. The two edges will be faired with the torture board before final rounding and glassing. 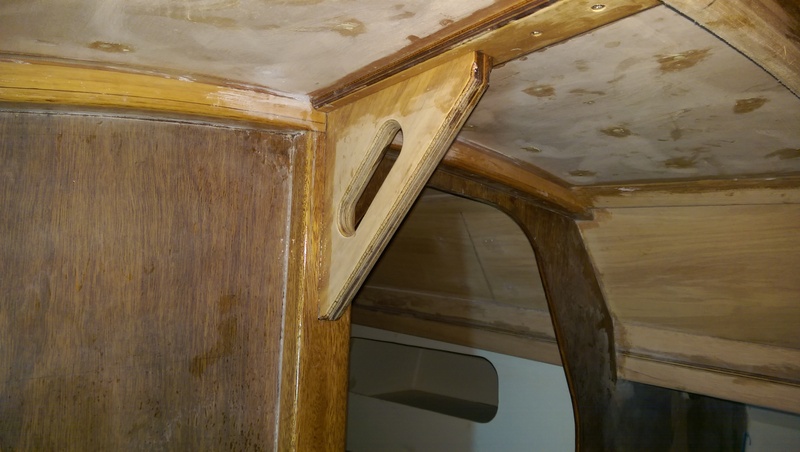 A couple of the small jobs I wanted to do were the knee at the mast step in which in incorporated a hand hold and the front of the V berth bunks where a small in fill piece was needed so that the bunk lids would not foul the frames when lifted. One job that I have been putting off is the sanding of the ceiling as the overhead sanding is dusty. I solved that problem by connecting the vacuum cleaner to the sander and not only is it almost dust free but the suction pulls the sander down to the surface making the job quite easy. I got quite excited with this development and sanded half of the deck, some of the hull and some of the cabin sides in an afternoon. The sanding was possible despite the strong winds as the vacuum took all the dust away. Other interesting jobs awaiting are fitting the control cables to the engine and fitting the water lock muffler and exhaust pipe but if the weather is fine I must push on with the deck glassing and painting so that we can start putting fittings on the deck while I finish the coamings on the cockpit. So many interesting choices. 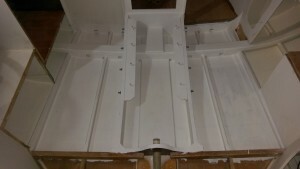 Once the glue was cured the anchor locker hatch could be cut. It is pouring rain today so much that I cannot recall the inside of Passion being so wet in ten years of sailing. We did get a race in if a shortened course slow 5 nautical miles constitutes a race. 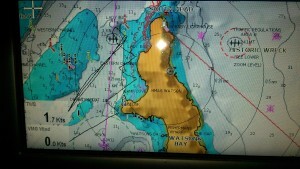 We did get to set the spinnaker and gybe it a couple of times so it is all good practice. The rain soaked spinnaker down below did contribute somewhat to the water inside Passion and now the spinnaker is drying out in our sun room at home. Before the rain returned I made some progress on Passion X. Since the last post the foredeck is completed and the anchor locker hatch cut from the completed deck. There are four layers of 3 mm ply right at the bow and back further where the curve of the deck is not so great there is 2 layers of 3 mm and a finishing layer of 6 mm ply. 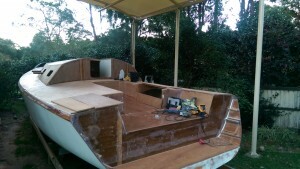 Once the deck was completed I was able to complete the 12 mm ply capping pieces from stern to stem. 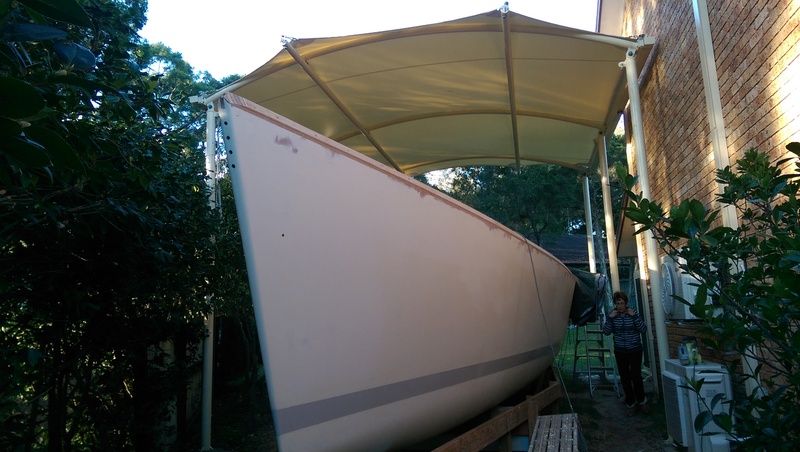 Yesterday was supposed to be wet and it started out that way but when the rain stopped mid morning I started fairing the excess from the capping pieces. There was close to 50 metres of ply edges to be planed flush with the hull and deck and by dark last night i was almost there. 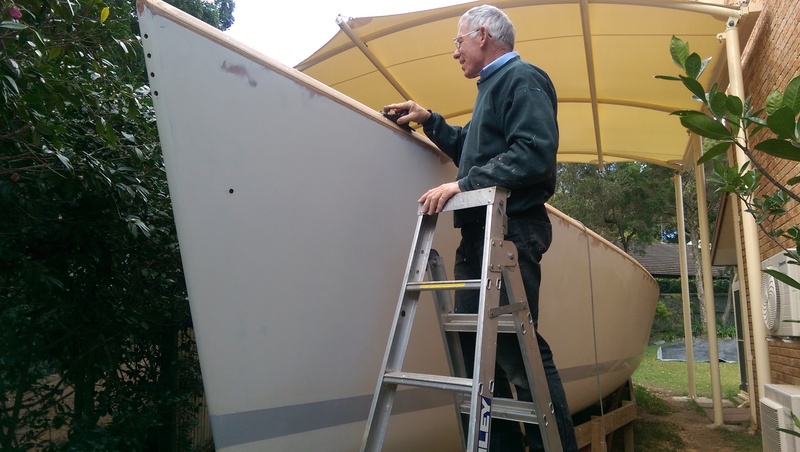 On Friday with help from Kevin we fitted the engine control lever to the hull and measured the length of control cables needed. 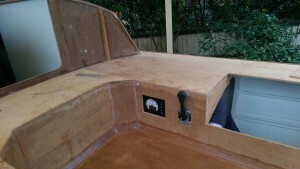 We also cut out the ply in the location of the engine start buttons and tacko so I can go ahead and make a recess for the panel. If the weather system moves though I will be able to get back to the deck tomorrow otherwise I will be busy sanding the cabin roof underside. 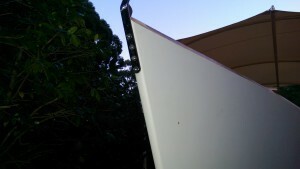 Most of the capping pieces on the port side of our Didi 40 Cr are fitted. 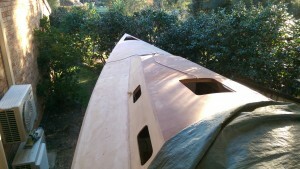 The starboard ones are cut and pre- drilled. The stem head fitting for the forestay is fitted so now I can complete the deck. The stem head fitting from the anchor locker side showing the laminated beams front and back of the anchor locker hatch. 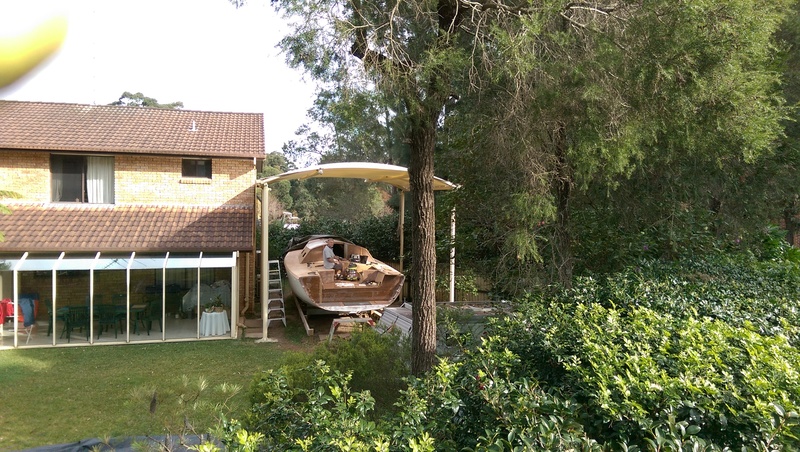 A sunny weekend means good boat building weather. 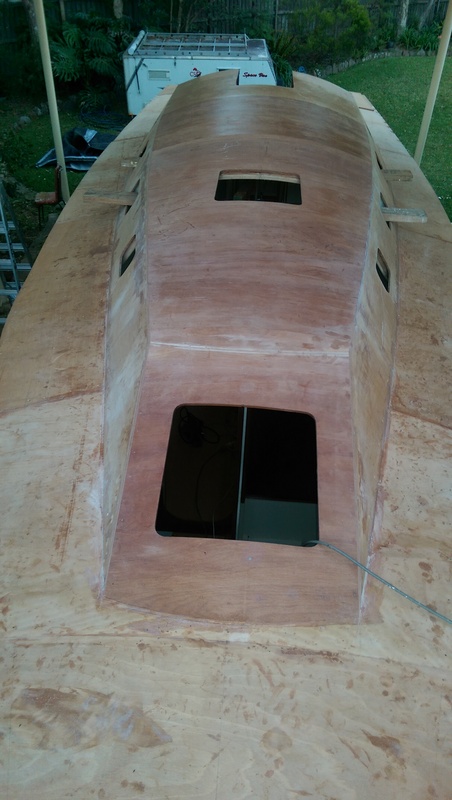 While I am reluctant to make too much noise on the weekend I cut out the plywood capping strips that cover the gunwhale and the hull to deck join. I managed to glue on the capping pieces for one side and each join was scarfed for maximum strength. The strips for the starboard side are cut, schafed and pre drilled ready for fitting after I do the final noisy trim of the gunwhale. 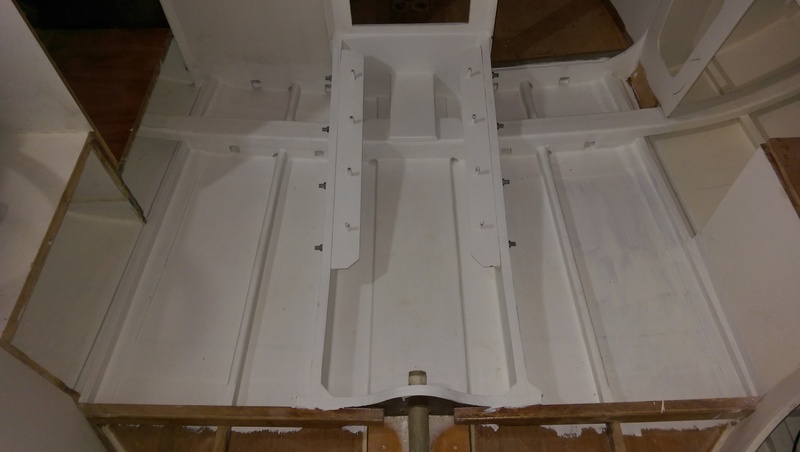 A less noisy job was fitting the forestay chainplate prior to installing the deck around the anchor locker. The gunwhales and laminated beams around the anchor locker had to be faired to get the final position of the forestay fitting. used a square to line up the drill bit perpendicular to the stem and eyed the mast post to get the side ways alignment. Once the first hole was true I used the stem fitting to get the hole spacing on the inside and drilled the remaining hole half from the stem and half from the anchor locker. I consider fitting the forestay chainplate a significant milestone so am pleased with the weekend progress. 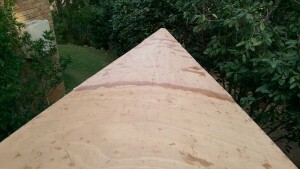 The final version of the trim on the back end of the king plank. It will get white epoxy in the morning. 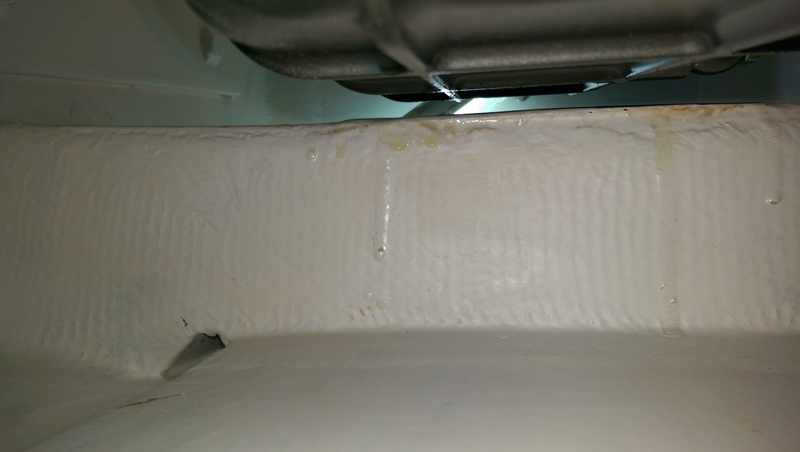 With the aid of the phone camera I could see under the sump and check the clearance. 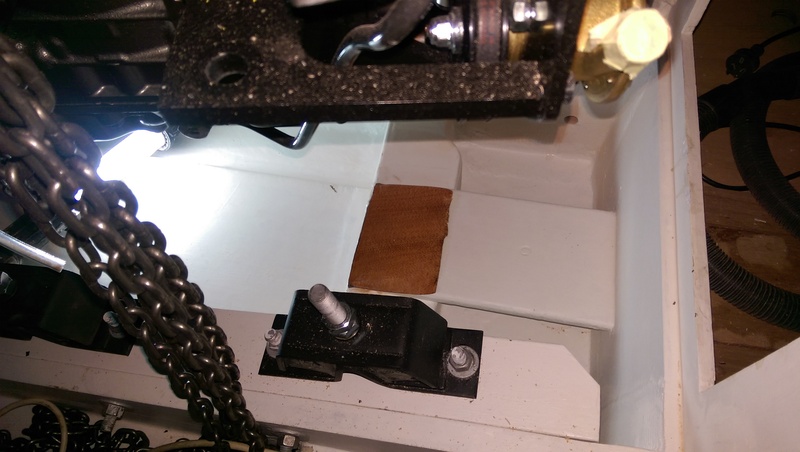 As I wound up activities yesterday I discovered the motor sump was sitting on the king plank that joins all the keel floors together. I had not trimmed the back edge as per the drawings. I was annoyed with myself for this so I timed how long it took to lift the motor and trim the timber. With the experience gained yesterday it took just fifteen minutes to lift the motor and 14 minutes to trim the edge of the king plank. 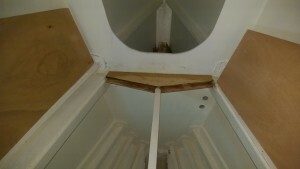 Then the raw timber had to be sealed with wet on wet coats of epoxy and painted white with the epoxy primer. There is always a use for left over epoxy and primer so no time or materials were wasted. The only drawback was hitting my head on the support beams many times. 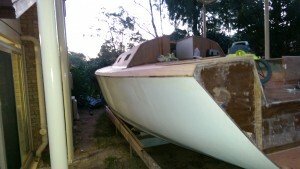 The rest of the day was spent trimming the excess plywood from the deck to hull join. The sound of the Makita blended in with the sound of the wood chippers cleaning up after last weekends storm. 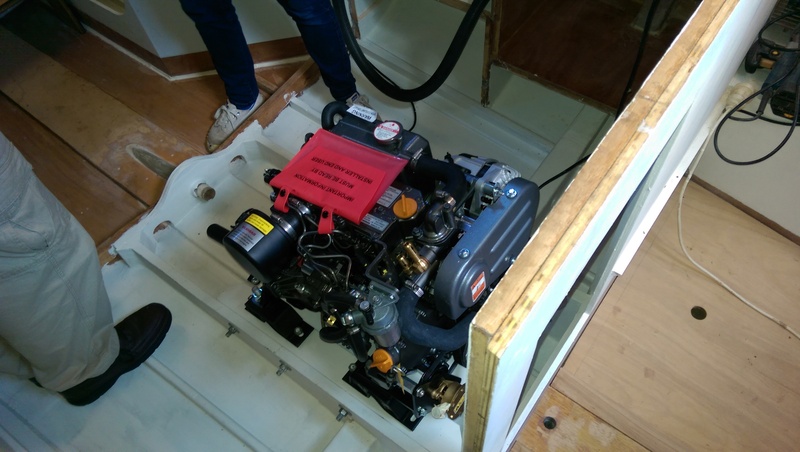 That should have been the end of the story but when I put the engine back on the mounts the sump was still just touching the king plank. Version two was a more aggressive cut and a check of the clearance using the phone camera so now there is clearance. 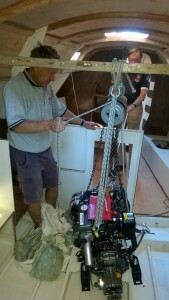 With the help of crew from Passion we lifted the engine into the boat today. It took longer than turning the hull but we had a very sociable day. I can add a few photos of progress over the last week but it has been mainly trimming and sanding and painting so no big impact photos. While we worked on Passion X two of the crew did our duty roster at RANSA for the Winter Wednesday race and with the fourth place awarded for doing the duty we are now third overall in the series after six races. We used a plank through the widow openings to support the engine inside the hull. We added a second plank through the next set of windows and a cross beam to get exactly over the engine bed. The Yanmar YM30 AE-S on the engine bed. I need to lift it off the bed and trim off the aft end of the king plank which is just touching the sump.